First of, thank you for your hard work on the library. It takes me so much time to understand a little bit of KS library. I have a question, Can I use your IRLib to use 2 receivers at same time? I mean they can both receive signal from a single 38 kHz IR source and pull 2 different PWM pin high? Hello:- Thanks for the IRlib. I am a volunteer working with continuing care clients. I am using Arduino to serve as a multi-purpose remote control amongst other things. I came across a Cisco 8642HD pvr whose remote’s output is not decodeable by IRlib. Would you say the simplest method would be to just clone the pulses? 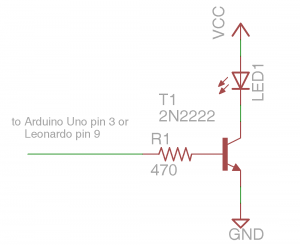 Could I modify IRlib to do that as in here http://hackaday.com/2013/11/20/primer-tutorials-for-arduino-ir-remote-cloning-and-keyboard-simulation/ ? Would appreciate some guidance. Thanks. Surely the positive anode has the longer connector and should connect to the resistor? You are correct I had polarity backwards. The schematic is correct but my description was wrong. Good catch. It depends on what version of the nano you have. We support the ATmega328 used by the nano 3.x but not the ATmega168. i want to how to access the receiving code to on off any output pin of arduino using if statement.should i use mydecoder-decode() return value to put in if statement? You would need a receiver object to receive the code a decoder object to decode it. Then the results would be in MyDecoder.value and you would use that value in your if statement. I suggest you read through the documentation and look at the example code. Look at the servo example later in this tutorial. Except instead of servo commands you would have commands to turn off or on whatever pin you wanted depending on the value received. Thank you for your work on this article and the library. I was wondering if the library would work with a tsop4856 or not. I know that it is for 56 kHz modulated info, but you do reference it (the 56 kHz ir) in the hardware area. Everything I am able to find to read on the arduino uno and the ir lib seems to suggest to me that the library was written to be used with 38khz carrier frequency. I just happen to have tsop 4856s on hand, but can order some 38s if necessary. I will probably acquire a cheap universal remote for my project. Thanks for you input. The modulation frequency depends on what protocol you want to use. Most IR remotes use frequencies of about 38 kHz. However the protocol which I call “old Panasonic” which is used by Cisco and Scientific Atlantic cable boxes and a “RCA protocol” which is used by some very old RCA brand equipment both use 56 kHz. Most people are interested in using 38 kHz devices and are worried if they can receive 56 kHz signals. I’ve had mixed results. Some 38 kHz devices can read 56 kHz signals. I’ve never had a 56 kHz device so I don’t know if the gap in the bandpass filter is wide enough to pick up 38. So you’re kind of doing the opposite of what most people are asking me 🙂 The bottom line is the library can use any frequency from about 36 to about 58 for transmitting and for receiving it can use whatever your hardware device is. It should work just fine with that device if you are actually sending it 56 kHz signals. I’ll be interested to see if a 56 kHz TSOP device is wide enough to sense 38 signals. Thanks for the library! 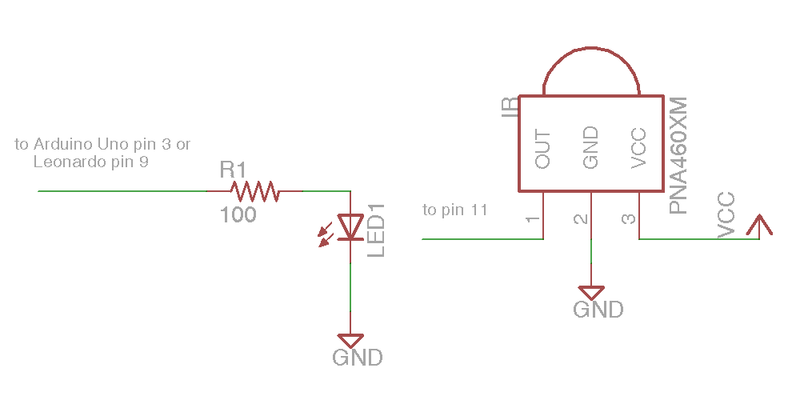 I want to suggest a change to your schematic using a transistor to drive the IR LED. You rightly say that you’re overdriving the LED, but why bother? Wouldn’t it make more sense to put a current limiting resistor in series with it which would remove all risk of destroying the LED and possibly the transistor. Most IR LEDs I’ve used have a max current rating of about 100mA so for a 5v supply, a resistor value of 47ohms would allow a max current through the LED of about 75-80 mA, well within the rated range. If you want a higher output, just add a second resistor and LED in parallel with the existig LED and resitor. Just feels like a better design. The purpose of that schematic was to provide the simplest emitter possible using parts you might find around in your spare part drawer. For most of the applications of this library, the overcurrent is not a problem. People like to get as much power as simply as possible. I do want to give other possible schematics including one with up to 4 LEDs each with current limiting resistors. hi! excuse my English. which is the voltage VCC in the schematic IR emitter transistor? thanks! 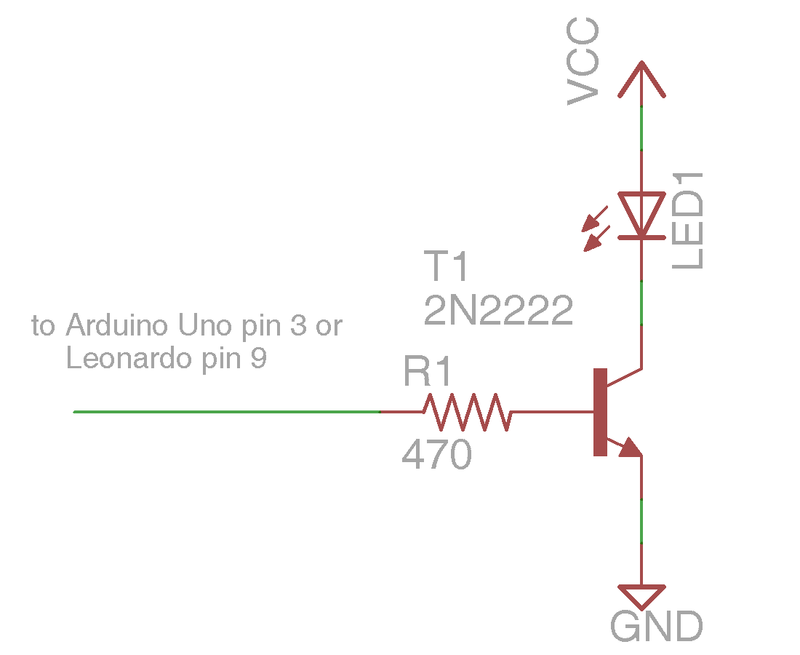 Use whatever voltage your Arduino is using. If it is a 5v Arduino then use 5v. Some Arduinos use 3.3v and that should work as well although the transmitter will not be as powerful. Really nice tutorial, thanks for it. I’ve done my setup using arduino uno for the IR transmitter and arduino nano for emitter. I got no problems decoding the NEC signals from my remote control, but this is not the case with my arduino emitter. I tried other protocol (SONY) and it worked just fine. What could be the cause of that? Let me make sure I understand your emitter will not work with NEC but it does work with Sony? It is highly unusual that the choice of protocol affects whether or not a transmitter works. When you say that NEC doesn’t work do you mean it will not control your home electronics devices or does it mean that you cannot decode the signal using the receiver on the other Arduino? Same question about the Sony. When you say that the Sony works do you mean it operates your home electronics equipment or do you mean you’ve successfully decoded the receiving of the Sony signal? I’m going to need more to work with to figure out what your problem might be. May I pose a different but related problem. The parking gate of our building opens up with a dedicated remote. I would like to use a smartphone with IR blaster to do the same. 1. to use Arduino record and copy the IR sequence from the remote. 3. Use an application on the smartphone that knows to read such file of IR sequences. I think that I know 1. i.e. how to read the IR sequences using the Arduino and the library. Any suggestions regarding 2 and 3 are welcome. I need to receive a continuos variable frequency signal from a generator, so i use photodiode instead an TSOP. Can I copy the decoded frequency to a variable? I have that works out for you. I don’t have the experience with photodiodes. How to receive and decode the IR frequencies of Tata Sky DTH? I’m sorry I don’t know what a “Tata Sky DTH” is. But there is an entire section of the documentation on how to identify and decode unknown protocols. It’s an advanced topic but it is fully documented.